Two key electoral contests later this month will tell us how the Congress and BJP approach the semi-final of Indian politics — Assembly elections in Rajasthan, Madhya Pradesh and Chhattisgarh, scheduled for December 2018. By-elections for two key constituencies in Rajasthan — Alwar and Ajmer — are to be held on 29 January. The two seats fell vacant after the deaths of sitting BJP parliamentarians Mahant Chand Nath and Sanwar Lal Jat. The results would not only point at the trend in north India but also decide the future of the Congress and BJP leadership in Rajasthan. For the Congress, the two constituencies are important for several reasons. 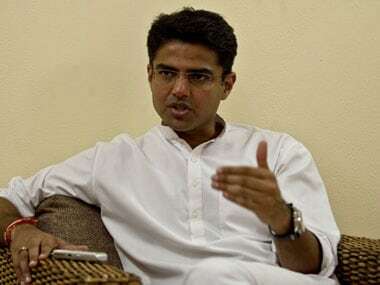 Ajmer is the home turf of its state unit chief Sachin Pilot. A loss here would be a personal setback for Pilot and will raise questions about his ability to lead the party in the Assembly polls. Ajmer is also key to understand the caste dynamics of the state. Results here would indicate how the major castes in Rajasthan are aligning before the big battle. Similarly, Alwar is the home town of another Congress heavyweight, Rahul Gandhi's friend and adviser Bhanwar Jitendra Singh. If Congress loses the two constituencies, it would indicate that leaders trusted and handpicked by Rahul lack merit, ability and popular appeal. And since the results could be seen as a reflection of the state leadership, Congress is treading with caution in both Ajmer and Alwar. In Alwar, it has replaced Singh, who contested the 2014 elections, and fielded Karan Singh Yadav. Congress is hoping that replacing Singh, a Rajput, with a Yadav will help it make inroads into the Ahir vote bank, which, if it combines with Muslims and Meos from the region, can be a game changer. Yadavs had supported the BJP in the 2013 Assembly and 2014 Lok Sabha elections. But this year, the Congress feels, it can win them back through a candidate from their community. Another reason it may have chosen Yadav is because it fears that if Singh loses, it would be a loss of face for Rahul himself. So, it may have decided to shield both the Congress president and his loyalist from political uncertainty. In Ajmer, meanwhile, the dilemma is even tougher. Pilot had contested the 2014 elections from this constituency after considering several other "safe seats". Logically, once bypolls were announced, he should have been the automatic choice. But the Congress hasn't yet decided its candidate for Ajmer because a defeat for him would trigger two things: Firstly, personal humiliation for him. And secondly, clamour to replace him with Ashok Gehlot, who is back in favour after Congress' improved performance in Gujarat, where he was in charge of the campaign and backroom negotiations. The consensus within the state is that Gehlot is best placed to challenge Chief Minister Vasundhara Raje. But the Congress is unwilling to name him the face of its campaign after having invested in Pilot for almost four years. One way to find out if Pilot is acceptable as a state leader would be to let him contest from Ajmer. But since the Congress is not sure of the outcome, both Pilot and the party are delaying taking a decision. The other fear in the Pilot camp is that Gehlot could work behind the scenes to get Congress defeated in Ajmer, and thus get his rival out of the way. For the BJP too, there is a lot at stake. A loss in either of these constituencies would reinforce the perception that the BJP's popularity is declining. It would also be a mini referendum on the performance of the Raje government. If the BJP loses, it would not be a surprise if calls for change in leadership emerge from within the party. Aware of these challenges, the BJP is keeping its cards close to its chest. In Alwar, it is yet to announce its candidate even though the Congress campaign is in full swing. With the caste calculus in mind, it is considering local heavyweight Jaswant Yadav to ensure his community stays with the party. There are also rumors that it might ask Baba Ramdev to contest from Alwar. Alwar would also indicate if the BJP's cow politics can be a productive political strategy. Alwar has been a laboratory of the "gau rakshaks" for the past year or so. Cow vigilantes have been routinely clashing with cattle traders, mostly Meos, in a bid to polarise the electorate. A few months ago, they killed a local trader Pehlu Khan. But in what is seen as an indicator of the BJP's strategy, the state government has been watching silently as vigilantes pick and punish traders without fearing the law. In Ajmer, it is yet to confirm the candidature of Sanwar Lal's son despite pressure from within the organisation and from the Jat community, which treated the deceased parliamentarian as the biggest leader of the region. While the BJP is hoping to cash in on sympathy for Jat's son, it is also wary of promoting dynastic politics.